Lockup latches/flops are used to fix hold time in scan chain. They don't affect non-scan functionality. However they would affect ECO result, if they are not taken care of properly. The following paragraph describes a metal only ECO case which involves lockup latches. An optimal ECO can only be achieved when the lockups are handled specially. The RTL changes involve gated clock enable signal logic update. 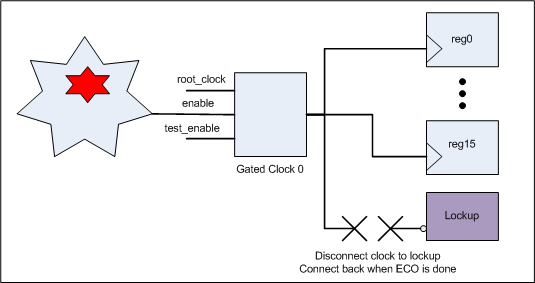 Figure 1 shows the reference design has changes in gated clock enable signal logic. 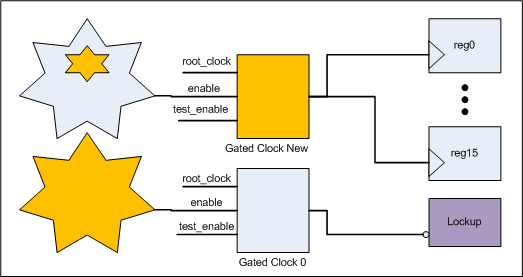 The implementation design should have a corresponding patch in gated clock enable logic. 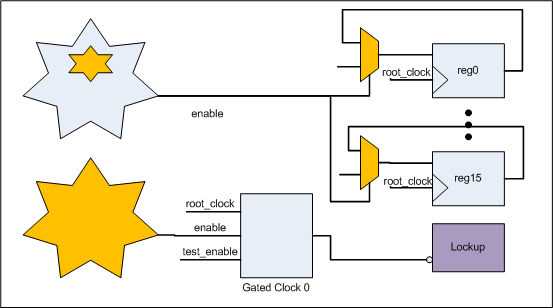 However, the gated clock in the implementation design drives lockup latches which are not in the reference design. If no special treatment is done on the lockup latches, ECO result has redundant logic like a new gated clock cell, and duplicated enable signal logic as the items shown in Figure 3 in orange color. Either Automatic ECO flow of Gates On the Fly or other tool on the market like Conformal ECO gives the same result. In this metal only ECO case, since no spare gated clock cell is available, 16 MUXs are needed to convert the gated clock which makes the resource even tighter and there is not enough spare gates to do the job at all. The right solution is to disconnect the lockup latches before automatic ECO. After ECO is done, connect back all lockup latches. read_def("topmod.def");   # Read Design Exchange Format file, optional. #  a new updated spare list file will be written out. # The updated spare list file has default name 'spare_cells_script_name.list'. When there are multiple modules in 'fix_modules' command, a more complicated Perl data structure can be used for lockup handling. In order to achieve optimal ECO solution, mixing Automatic ECO Mode and Manual ECO Mode is the best choice. It is especially important in Metal Only ECO where resource is very limited.